We hope everyone is enjoying their last few weeks of summer with friends, family and fabric! This is a high quality 1/4" thick acrylic curved ruler set for longarm quilting use. Or it can be used to mark quilting designs for quilting on your domestic sewing machine. or tell us about your favorite long-arm quilter! Good Luck! Winner will be announced on Monday 8-24. Only one comment about quilting?!…hmm.. how about I’m a teacher by day and a quilter any other open minute I have available to quilt! I can get lost on my quilting and the days stress disappears among the colors, and designs, and the hum of my machine. Quiting is what keepse sane!! I’m doing a Row by Row quitl and needed your ruler. I found your site and am excited to learn more. Your quilts are beautiful . I’m ready to sew! Enjoyed the QAL, my local quilt group liked my quilt. I have been making several of your patterns and liking the curves, finding it easy to get the seams matched up with your technique of cutting them to size after sewing the curved blocks. I LOVE quilting! I have my own long arm now and really enjoy the process (even through it can be stressful) of coming up with how to quilt my stack of unfinished tops. Thank you for a chance at such a great giveaway. Your quilting has been such a great inspiration for me. I visited a local quilt shop today. They had a great display showing your quilts. I couldn’t resist buying your ruler and can’t wait to get started on my own quilt. I started quilting 35 years ago and top quilted by hand. I now have a longarm that I absolutely love. I feel so blessed. I’m a busy longarmer. My challenge is finding time to quilt my own quilts! But, I feel blessed to have my own machine. I just bought a mid arm a few months ago and I am enjoying learning. I have only started using rulers. I think the curved cross hatching achieved with your ruler is fabulous. Have made three of your paterns. Love them all. There are not enough hours in a day. I just quilted my Metro Hoops quilt at Laurena’s Longarm Quilting in Burlington MA. She patiently taught me how to use the Statler Machine to make beautiful leaves in the circles! I think I will have to make another Metro hoops quilt. 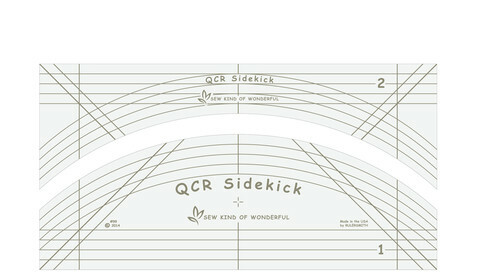 I don’t do a lot of ruler work, the sidekick just might be the one I fall in l ove with! Thanks for th giveaway ! I have been quilting for more than 10 years and did all my quilting in my home machine. Two years ago I got my long arm and I love it. It was a challenge but I think I have tame that stinker. Love not to have to baste my quilts, I’m not as young as I think and not having to be in my knees in the floor basting and fighting the quilt in the home machine is like being in heaven. Love quilting it is my therapy. I do not own a long arm, but I am in awe of those who use it so skillfully. However, I am slowly learning to quilt on my domestic machine and I am finding it a lot of fun. Your ruler would really inspire me! I quilt all my quilts on my domestic machine. I love doing free motion! It feels like drawing and adds so much texture to the quilt. I have been quilting since the 70s and haven’t made enough yet. I have a longarm but still struggle with the more advanced free motion work. Pantos are my forte. I have been hand quilting and tying quilts but I am really wanting to learn FMQ on my sewing machine. So excited to about your patterns, so gorgeous ? My daughter and I always make sure one of your patterns is in our project basket when we go to our guilds annual retreat. Love your work – keep designing! !